Posted July 5, 2017 by James Cornish & filed under Lists. If you didn’t know that Rogue One director Gareth Edwards is even more of a Star Wars fanboy than most of us – though we will fight him on that…. with lightsabers – the sheer amount of fanservice in the movie makes it pretty clear. From a quick appearance by certain scum and villainy in the marketplace on Jedha to an ending scene that will surely stick with us all for a while, Rogue One doesn’t take its place in the Star Wars saga lightly. Because apart from anything post-Return Of The Jedi, this is the movie that pulls the entire saga together as one story. And now that we have access to both digital and physical copies of Rogue One, that means fans combing through every single frame to find things to gush over/complain about/tweet the Lucasfilm Story Group about. We’ve already got our editing software working for it. And since the lunatics were definitely running the asylum with the production of Rogue One, there are a hell of a lot of tiny things to find. So while you gear up for your sixth or seventh viewing of Rogue One (hey, we don’t judge here), we thought we’d give you some of the more subtle Easter eggs to keep an eye out for. Buy Rogue One on Blu-ray on Amazon here. These are 10 Rogue One Easter eggs you may have missed. Punch it! 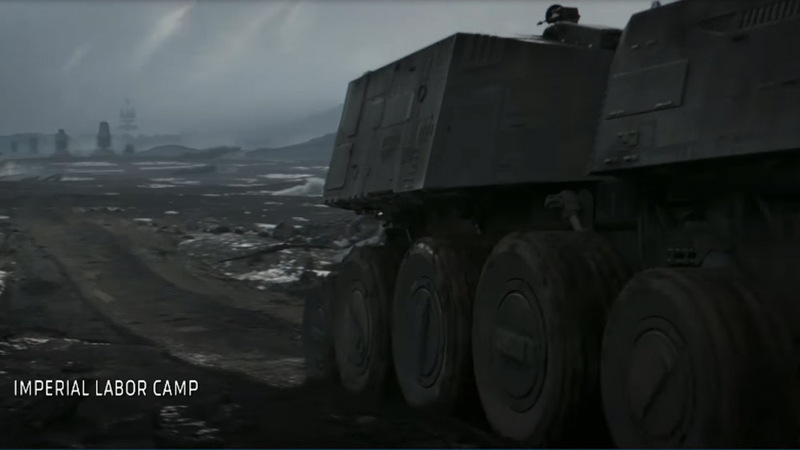 Kicking off with a very quick one, the prison transport that Cassian Andor and K2-SO rescue Jyn Erso from at the start of the movie is a Juggernaut. Or a Clone Turbo Tank if you had the Lego set. Originally an early concept for the AT-AT, the Juggernaut was introduced in 1995 in the Expanded Universe novel Darksaber as an Imperial vehicle. After that it appeared multiple times in the both the hands of the Rebels and the Empire in video games and comics but it finally found a place in canon material in Revenge Of The Sith. And is one of the few times that the military in Star Wars realised that wheels were a good idea. Like a lot of designs, it doesn’t get a huge amount of screen-time but if you look closely, you can see it as part of the Republic forces on Kashyyyk. It would have also featured in the Order 66 montage but the scenes featuring it firing on Jedi Master Quinlan Vos were cut during pre-production. Oh and as a little bonus; the planet Jyn is imprisoned on is called Wobani, an anagram of Obi-Wan. We’re guessing that naming that one didn’t take the Lucasfilm story group too long.